There’s just something about dark red roses that I love. They’re dramatic. And beautiful. And they’re the perfect flower to represent all things love. They’re also a perfect flower to adorn a lovely white wedding cake, adding both beauty and drama to the cake. 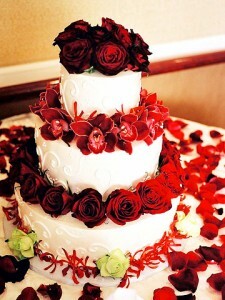 And when you add in some deep red orchids and green roses, you have an incredibly gorgeous cake. The colors of this cake are ideal for a late fall or winter wedding – especially around the Christmas holidays with the red and green floral combination. If you’re carrying a bouquet of red or black magic roses (which are a deep, dark red color) this cake would be the perfect centerpiece at the reception, blending with the colors of your bouquet. I found this practically perfect cake here. It was photographed by Mark Hopkins.